The Old citadel was the first to be excavated at the site, and is the probably location of heretofore undiscovered archives. ; When uncovered, the area showed a complex of round house dwellings, temples and palace structures, dating back to the 4th millennium BC. En route to the Temple Site, just below the old citadel, is an incline on the stone hill. ; Carved into the hill is an intricate and large (almost 20 meters long) design. ; The design resembles a rudimentary map, and the shape of the rock resembles the Ararat side of Mt. Aragats in miniature. ; Inscriptions also include several early Haikassian script symbols (though carved at Metsamor much earlier, ca. 3000 BC), and forms one of the basis' for establishing the old Armenian script during the Bronze Age around Metsamor. Three temples were uncovered and are covered by a metal structure. ; Vandals have desecrated most of the altars you see. ; Luckily they are only three of an entire complex that was preserved by recovering them after the initial dig in 1967.;; The temples are unlike any other uncovered in Western Asia and the Ancient world, indicating a very distinct culture at Metsamor during the 2nd-1st millennia. Within the altar spaces are numerous bowls set into the temple floor and a complex series of clay holders. ; Very little is understood about the ritual that occurred here, though animal sacrifice was a part. ; The holders probably held rare oil mixed with myrrh and frankincense, purified wine, wheat and fruit (seeds were discovered in some of the shallow bowls). The foundry dates from the Early Bronze Age (ca. 4000 BC), though recent digs in the area uncovered signs of metal processing as early as 5000 BC. ; The complex of smelting furnaces and molds around you date from the mid Bronze to Early Iron Age (3000-2000 BC). ; The complex becomes more astounding the more you walk through it. ; Several huge underground caves were uncovered that are thought to have been storehouses for base metal, as well as a granary for winter months. ; Stretching just below and around the Upper Citadel, the foundries processed Copper, Bronze, Iron, Mercury, Manganese, Strychnine, Zinc and gold. ; The first iron in the ancient world was probably forged here, though it was not considered as important as bronze, giving the jump on development to the Babylonians. The Upper citadel is covered over, except for a few pits. ; The main building was the city palace or main temple. 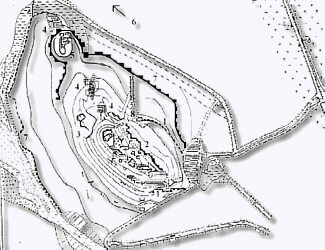 ; The inner walls ring the site on three sides, with the foundries just below. The observatory rivals the discoveries at the citadel for importance, substantiating theories on the birthplace of the zodiac and origins of astronomy in the ancient world. ; Dated ca. 2800-2500 BC, when the zodiac is figured to have been concluded, the observatory was also the primary religious site and navigation center for the Metsamor culture. ; Hundreds of shallow bowls are carved onto the surfaces of three large rocks that rise above the surrounding river delta. ; The use of the bowls are unknown, many are linked by equally shallow "canals" (we're talking real small here, no more than a few inches in diameter for the bowls). ; They might have been filled with oil that was lit at night as part of a ritual celebration (if so, they would look very much like a 'bowl of the universe'; on earth), or they may have been used to smelt and forge metal in another sort of ritual. ; Imagination allows you to decide for yourself. You need to be very careful while exploring the observatory site, since the inscriptions are carved on basalt and tuff, and have already been eroded by exposure to the elements since uncovered in 1967.; For more information on the site, see The First Astronomers? The outer walls are 2nd-1st millennium BC, laid during Urartian times. ; The walls mark the greatest extent of the ancient citadel, though the necropolis and graveyard extend for another 200 hectares into nearby Taronik Village. The Medieval Precinct was located on top of the old citadel. ; The discovery of medieval coins and artifacts there prompted the 1967 excavation. ; Foundations were removed to uncover the older layers of the city.